Snrky: It has the added benefit that management likes the resulting usage reports. It has the added benefit that management likes the resulting usage reports. It may be silly, but I find those little spinners strangely satisfying...at least when I know I'm not actually waiting for anything to load. Just watch for awhile and tell me you're not just a little bit more calm than you were before you started. Not working for you? Maybe you need to customize your own. Here's a good place to start. Also, I would be lying if I said I never intentionally coded wait time to intentionally give a spinner enough time to actually appear on a page. I mean you do need to test it at some point, right? I haven't, however, been stupid enough to let said code get distributed beyond my local machine. 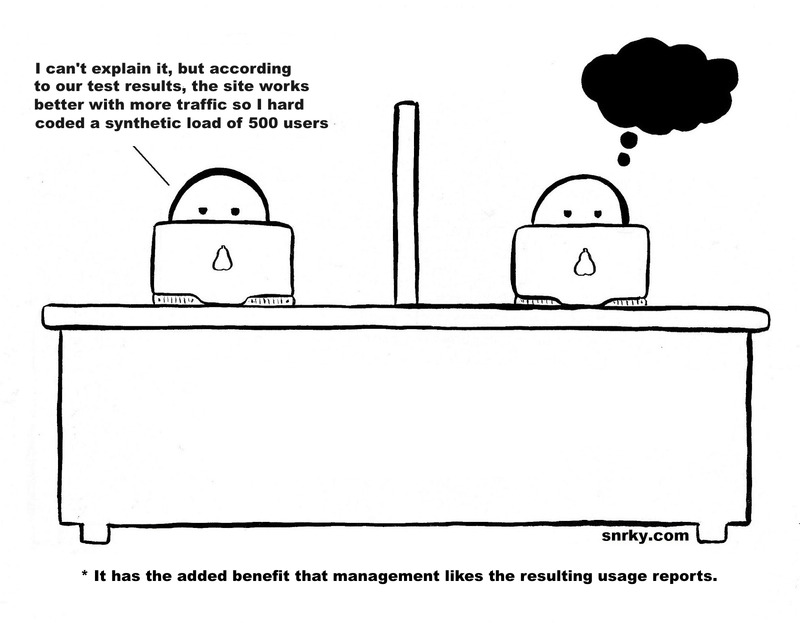 Title: It has the added benefit that management likes the resulting usage reports. Snarky: I can't explain it, but according to our test results, the site works better with more traffic so I hard coded a synthetic load of 500 users.